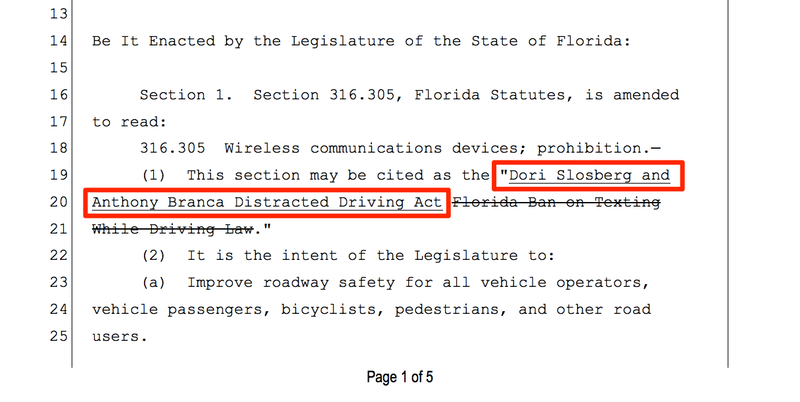 Florida House Representative, Emily Slosberg, filed the Dori Slosberg and Anthony Branca Distracted Driving Act, or House Bill 121 on Thursday, August 31, 2017. The act seeks to improve roadway safety for all vehicle operators, vehicle passengers, bicyclists, pedestrians, and other road users by preventing crashes related to texting and driving. The bill also intends to reduce serious injuries, deaths, property damage, health care costs, and health & automobile insurance rates. If enacted, this bill would allow Florida law enforcement officers to stop motor vehicles and issue citations to people that are texting while driving. 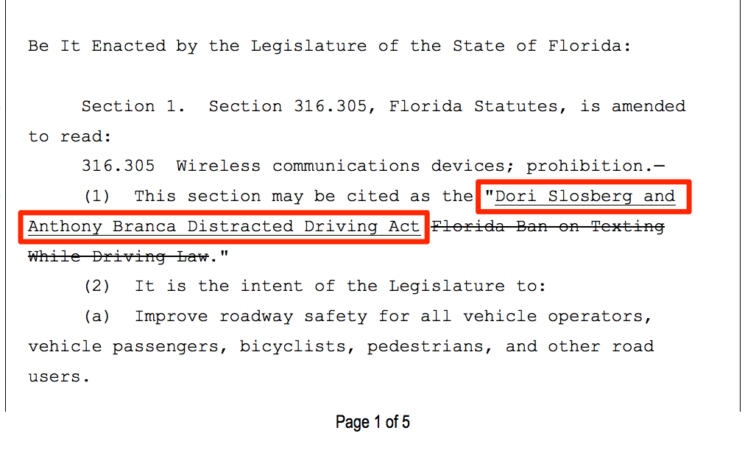 The Dori Slosberg and Anthony Branca Distracted Driving Act was named in memory of Representative Emily Slosberg's twin sister, Dori, who was killed at the age of 14 in a vehicle crash in 1996, and Anthony Branca who was 19 years old when he was killed by a distracted driver in Tallahassee, Florida on November 7, 2014. Overall, HB 121 revises short title & legislative intent, and revises penalties for violations of provisions regarding texting while driving. The bill provides enhanced penalties for violations committed in school zones & crossings, and also requires law enforcement agencies to adopt policies prohibiting racial profiling in enforcement. Additionally, it removes requirement that enforcement be accomplished as secondary action.